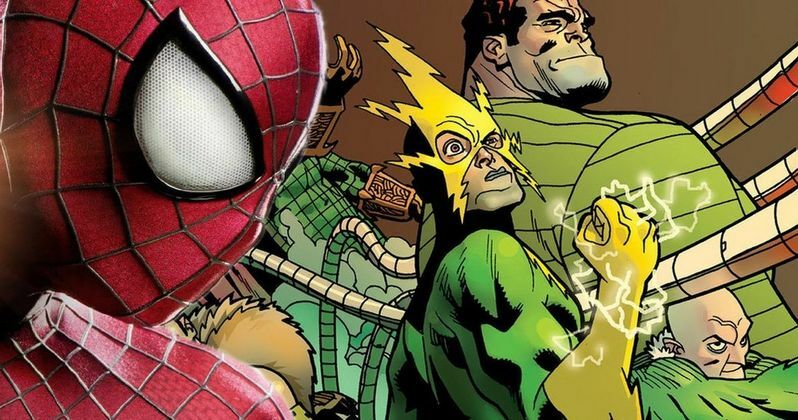 The Amazing Spider-Man spin-off The Sinister Six is quickly building speed, with many fans excited to see this classic line-up of villains on the big screen. But even though The Amazing Spider-Man 2 is working hard to bring these guys together, which is a thread that will be carried over into The Amazing Spider-Man 3, don't expect to see the original comic book characters in the final movie. "Nothing is sacred. I mean it's going to be the best Six that you can imagine, but it's going to make sense in the world that we're building." With The Cabin in the Woods' Drew Goddard in negotiations to direct, we can expect some horror elements to seep into the narrative. Which means we might see Venom as part of this team, since he's set to get his own spin-off as well. The original gang of Spider-Man hating baddies consists of Doctor Octopus, Vulture, Electro, Kraven the Hunter, Mysterio and Sandman. While Electro is the main villain in The Amazing Spider-Man 2, it also sets up the presence of Vulture and Doctor Octopus. All three are sure things for The Sinister Six. But Kraven, Mysterio and Sandman are questionable. "When you translate comic to film the word 'classic' means the first fifty issues. Because after that we all made changes; changes that had to do with science fiction turning into science. I think just the need to move this world forward. So, of course we'll make adaptations about these guys and what was their motivations because many of them have multiple motivations. It depends, is it ultimate Spider-Man? Is it Spider-Man? Is it some three-piece issue that takes them to space? We have a bigger responsibility to represent the character of the villain as it was conceived, because that way it will survive the test of time." "All the rest... that's a movie. What an opportunity to make-- can you imagine seeing Paul Giamatti in a leather suit? I think they would have killed us. They gave us a hard time with the Lizard." With Goblin and Rhino in the mix for The Amazing Spider-Man 2, its unsure how much they will be utilized. We know Dane DeHaan and Paul Giamatti are returning for The Amazing Spider-Man 3 in some capacity, but will they ultimately join this line-up of ultimate super villains? The Daily Bugle viral has gone out of its way to set up Shocker, so he's definitely a possibility. And we can't overlook The Amazing Spider-Man's Lizard coming back into the fold, which has long been promised. Its unlikely that we'll see some of the more obscure villains like the giant alien reptilian humanoid Gog or shape-shifting Chameleon. But what about females? Scorpia, a psychotic female version of Scorpion, was once a member. And we can't forget about Janice Lincoln, aka The Beetle. But these are some of the most unknown characters in the comic books. Its doubtful they will be brought into the fold. Who do you want to see join The Sinister Six? Let Matthew Tolmach and Avi Arad know, they're pretty open to fan ideas.